Beijing has finally released its five-year-plan for the power sector. The wires are leading with news that China will cap coal power at 55% of total generating capacity by 2020, which would represent a drop from its current penetration of around 60% even if it suggests the country’s total coal power capacity will grow in real terms. But the plan also sets renewable energy targets that are so low they could be met even if deployment slowed down over the next five years, rather than accelerating as it has been recently. There may be, however, reason to believe China will actually surpass these targets. 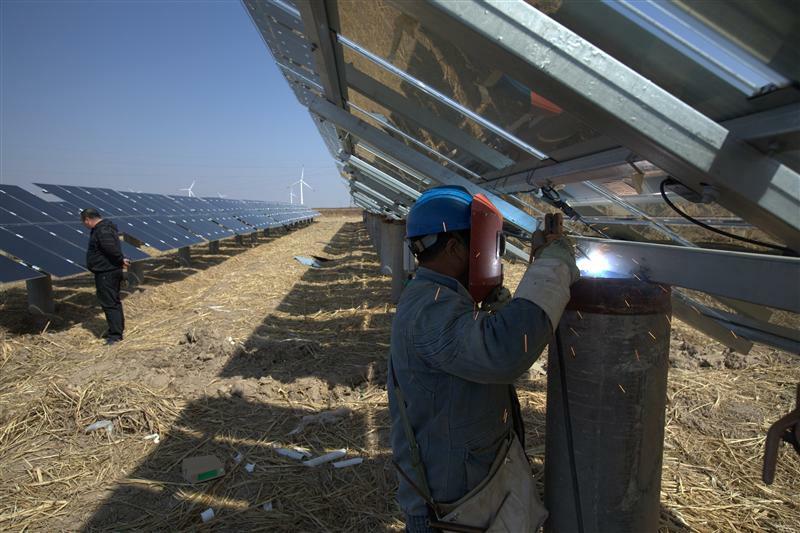 China has been installing wind and solar power plants at a dizzying speed in recent years, surpassing both its own targets and international records. This has helped the country cut coal use and improve air quality — but not everyone in China is pleased with the change. The country’s coal industry, still a major source of employment and GDP, has seen demand fall and coal-fired power plants sit idle while all new power demand has been covered from non-fossil sources. That may be why China’s leaders are holding back on their renewables drive, at least in rhetoric. Overcapacity in coal power has pitted renewable energy and coal against each other in the grid and led to a substantial proportion of renewable power generation being wasted whilst coal firms are forced cut investment. The power industry has sought to blame rapid renewable energy development, along with fossil overcapacity, for these problems. The newly released five-year plan for the power sector sets targets for wind and solar installations that would see wind power capacity growth cool down compared with 2015. The targets would keep solar power installations at 2015 level until 2020 but don’t support further acceleration. Even with these targets, China will remain the global leader in wind and solar installations for the next years. Furthermore, the reality may be very different. China has consistently overachieved its renewable energy targets, so a relatively low target does not necessarily mean that actual deployment will slow down, but a strong target would of course provide a more stable environment. The other area where the new five-year plan was expected to make headway was tackling coal power overcapacity — but again the lobbying may have paid off, at least with the rhetoric. The plan limits coal-fired power generating capacity to 1,100 gigawatts in 2020, up from the current capacity of 920GW. With 200GW of coal-fired power plants already under construction, the plan will require entirely stopping new projects from going into construction and retiring existing capacity or cancelling some under-construction projects. Given that China already has severe overcapacity and demand for coal-fired power generation continues to fall, allowing capacity to increase will further exacerbate this problem. The result is a plan that seems to deliberately underplay China’s hand in cutting coal use and tackling climate change, a curious move just a week after the ratification of the Paris agreement but one that can perhaps be understood in light of domestic pressure. In the real world, coal consumption continues to fall and solar power installations broke another record in the first half of this year.